Sometimes I can’t believe this is my life. I’m a former teenager mother. I have no college degree. I live in Arkansas, not Hollywood, Chicago, or New York. Yet all I do and have goes back to one thing: realizing God’s designed purpose for my life . . . and having the faith to run with it. My purpose in life is to inspire people to “live God’s story.” To find their own purpose. To dare to step out in faith. To realize they are part of God’s plan for this world. This is the theme of the books I write. This is why I mentor teen moms. This is why John and I have adopted three kids (adding to our three biological children), and we hope to expand our family in 2015 through adoption. It sounds like a lot. But because I know my purpose, I know what to say yes to . . . and what to walk away from (something I talk a lot about in my ebook Balanced). I’m busy, yes, but I wake up excited about each day and eager to see where God’s taking me. I live not to impress people, but to offer glory to God. Are you living a life of purpose? Or are you floundering, about to sink? Most likely you’re somewhere in between. 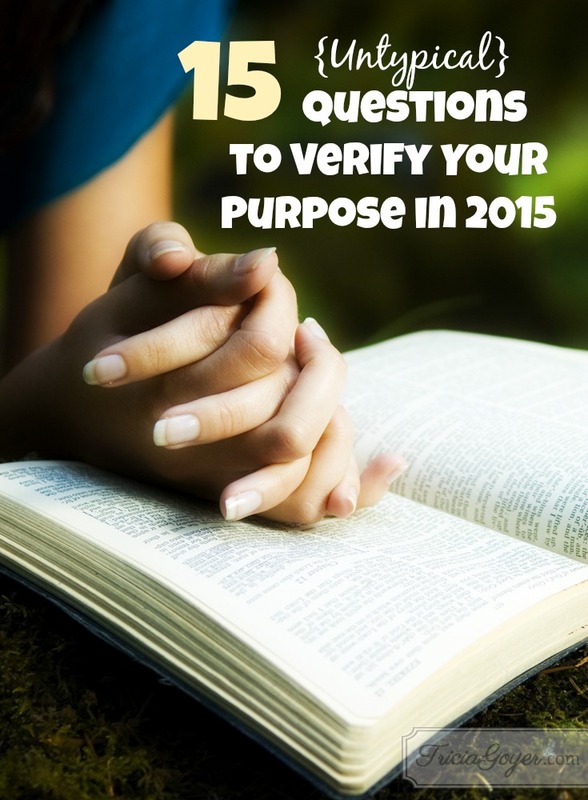 Here are 15 question to ask that will hopefully help to get you on the right track. These question aren’t the typical ones you find in most life-coaching seminars. Instead, they are questions I asked myself. How does my childhood joy point to my life purpose today? Read the rest of this post over at thebettermom.com. Download the printable so you can work through the questions yourself! great post, Tricia! How do you suggest singles approach the marriage/family questions?